New dual-step method provides 3D printing of conductive metals. Shalini Saxena for ArsTechnica: Customizable, wearable electronics open the door to things like heart-monitoring t-shirts and health-tracking bracelets. But placing the needed wiring in a complex 3D architecture has been hard to do cheaply. Existing approaches are limited by material requirements and, in the case of 3D writing, slow printing speeds. 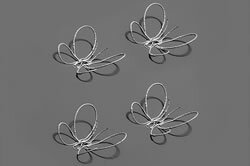 Recently, a research team at Harvard University developed a new method to rapidly 3D print free-standing, highly conductive, ductile metallic wires.